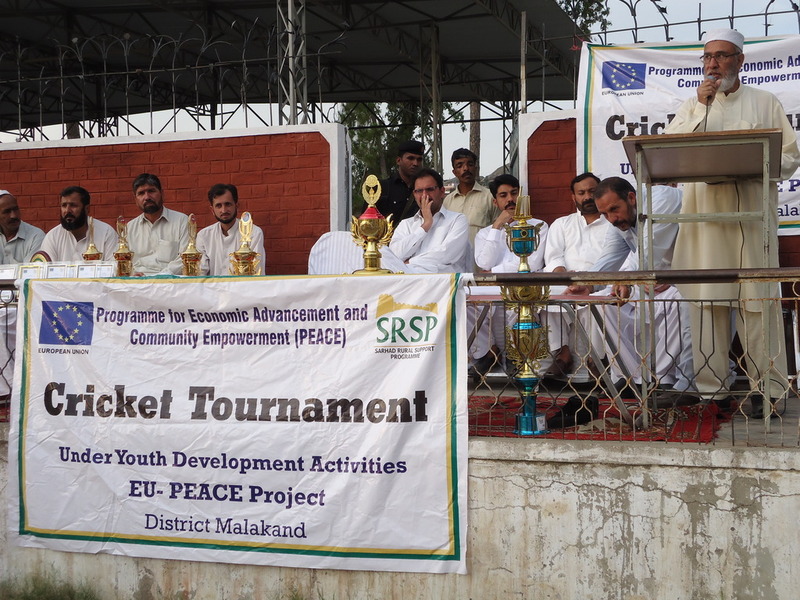 SRSP with the financial help of EU, is undertaking developmental projects of large scale in the Militancy hit Malakand Division. Malakand Agency has not only been hit by militancy but also by natural disasters inhibiting the area's true potential. Under PEACE SRSP is making a difference in this area by undertaking different infrastructure, social and economic activities. Electricity Generation by using the enormous water-based electricity generation potential of the area. Establishing a representative system of Community Organizations to take ownership of the projects. Improvement of Community Infrastructure (CPI) and Basic Social Services. Ensuring social and financial independence of women by providing them an equal opportunity in the process. Generating Economic activities by identifying growth factors. PEACE is developing renewable energy in remote locations through setting micro hydro units ranging from 50 KW and up-to 2MW. SRSP with EU support plans to install 165 community managed micro-hydro projects (MHPs) with an installed capacity of 21 Megawatt in six districts of Malakand division.So far, SRSP has initiated 155 projects in six districts of Malakand Division. These projects have an installed capacity of producing 20.63 megawatt electricity with expected beneficiaries of 81,000 households. Out of these 155 projects, the programme has completed 95 projects. Comparing the figures with baseline, it is evident that SRSP-EU PEACE programme has been able to cover whole of the deprived population through these improved/refined MHP. PEACE programme has achieved yet another major milestone and it has enabled SRSP to excel from producing kilo to megawatts through initiation of Golen 2 megawatt and Ashuran 1.2 megawatt electricity projects in district Chitral and Swat respectively. The mentioned projects were inaugurated by His Excellency Mr. Jean Francois Cautain. The partnership between EU and SRSP under PEACE programme has resulted in improving existing technology and bringing in technical and technological improvements to maximize efficiency and effectiveness of these hydro projects. One of the most prominent features of these MHPs is promotion of social cohesion at local level especially in post conflict scenario. Community members from diverse backgrounds and different economic classes/categories have come together at local level to manage and run these MHPs. At-least 155 village organizations comprising 620 community based organizations or over 15,000 households are directly involved in transparent execution of these MHPs. SRSP-EU PEACE micro hydro projects have made a remarkable contribution in providing renewable, clean and sustainable energy to local population in programme areas, which has reduced usage of fossil fuels, besides reducing pressure on precious forests. The environmental and economic benefits of these micro hydro projects are worth-mentioning. The current portfolio of 155 units producing 20.63 MW has been a major contributor in reduction of CO2 emissions by 55,000 tons/year. With all targeted 165 units producing 21.7 MW, the CO2 emissions would be reduced by 66,000 tons/year. Similarly these 155 units would reduce the cost incurred on kerosene oil from 2.3 million to 0.26 million €/year. Interestingly, productive use of sustainable and renewable energy has gained recognition in areas where micro hydro projects have been established. Women and men businesses have flourished (e.g. dried red persimmon) with useful returns (upto 156% increase in income) to further support their families and improve their livelihoods. Besides providing basic Literary and Numerical skills to over 6000 women through establishment of 240 Adult Literacy Centres, the programme will develop managerial, entrepreneurial and livelihood skills of over 14,000 women. It is imparting Literary and Numerical skills to over 6000 women in 240 adult literacy centers. In Malakand, patriarchy, low literacy rates, limited space for public activities, lack of access to resources and services all render women the most disadvantaged segment of society. The process of community mobilization, which sets up women organizations along with men organizations, is the first step towards providing space and defining a role for women in the development process. These institutions help build women’s group capacity and are an initial step in addressing their practical and strategic gender needs. PEACE is committed to promoting greater gender equality and giving women a larger share in social life. With the objective of promoting women's access to livelihoods, the action has identified a set of activities which are being undertaken with women to build their personal and group capacities to manage diversified livelihood resources related to an economy that is fast becoming monetized. One important feature of these activities is the literacy and numeracy skills training for women alongside their economic empowerment. By of end of project, 6,000 women would be provided with basic literacy and numeracy skills besides building the livelihood and entrepreneurial skills of 6,000 women. The skill trainings would be supplemented by provision of tool kits or livelihood resources, which would be extended to 6,000 poor women. The programme will also provide leadership and managerial skills to 2,000 women leaders beside producing 200 master trainers in different fields. The fourth component of PEACE project corresponds to increase in self-confidence of women and their ability to independently participate in social and economic activities. In accordance with local norms and culture, SRSP started its interventions with a meticulous approach under the PEACE programme that paved way for other women activities in patriarch and religiously charged Malakand Division. To be relevant to local context while keeping pace of activities at optimum level, EU-PEACE developed 507 women master trainers to facilitate formation of community based organizations and undertake women interventions under PEACE programme. With this new women work force, noticeable achievements, if not amazing, have been observed. 6,036 women have been provided with basic literacy and numeracy skills through establishment of 240 Adult Literacy Centers (ALCs). To engage women in economic development and become an earning hand, the programme has constituted 91 Business Interest Groups (BIGs) covering over 1,500 women entrepreneurs’ along-with identification of potential trades. In addition, women staff also identified 8,000 potential/existing entrepreneurs within women community institutions. Encouragingly, 7,820 of the identified 8,000 potential/existing entrepreneurs have been trained by EU-PEACE programme. On one hand basic enterprise development skills were imparted, while on other skills of existing/potential entrepreneurs have been refined. This resulted in establishing new women led businesses in Malakand division providing decent earning opportunities to women. Upon successful completion of skill development trainings, 6,001 trainees were provided with livelihood resources or tool kits to establish economically feasible and financially viable small scale businesses. 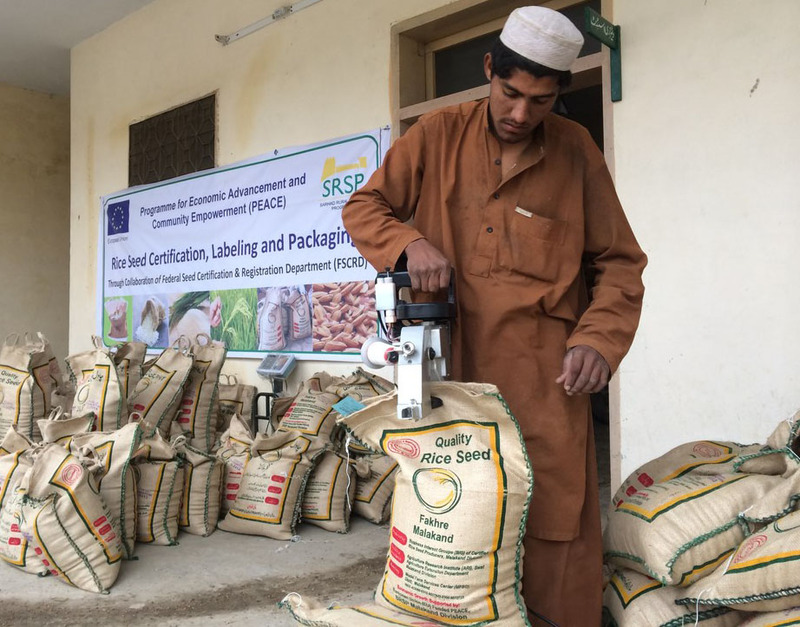 The fifth component of SRSP-EU PEACE programme relates to the growth of economic activities, where SRSP would be facilitating 4,000 farmers/producers in Malakand division. In this regard, SRSP has adopted a comprehensive approach for establishing and supporting potential value chains, small scale enterprises and entrepreneurs under PEACE programme. Formation of Business Interest Groups (BIGs), enhancing and refining business skills at local level, exposure visits, orientation on markets/trends and linkages with renowned and known business development services providers are few major achievements under this component. So far the programme has been able to organize over 4,320 farmers (414 women) in 321 (30women) Business Interest Groups (BIGs). A total of 3,699 (814 women) farmers were provided with numerous trainings in value chain development. Depending on nature of value chains or businesses, at least 2,975 (324 women) farmers/producers were exposed to major provincial and national markets besides developing their linkages with Business Development Service Providers (BDSPs), which has improved and refined products as per national and international standards. District specific value chains based on agro climatic suitability and comparative advantages of respective areas have been identified and supported under the programme. The crux of the RSP approach is to empower and strengthen the capacities of the people through organizing collective action to improve their social and economic environment. This collective capacity is created through the formation of broad member-based participatory organizations of the citizens. These are democratic institutions for local self-government, essential for building the capacity of the people to create, expand and improve their own communities. Formation of 11,273 women community based organizations with 68,272 members is a major achievement. During PEACE project, SRSP is committed to nurture and strengthen 12,000 community based organizations at various levels i.e. settlement/muhallah , village and union councils, which would be supplemented by developing a trained cadre of master triniers/resource persons besides enhancing managerial and leadership skills of over 50,000 community members and exposing them to best practices and experience sharing workshop.One of the important elements of the component is investment in youth which will have a high rate of return and youth development activities can immensely contribute in refining social, creative, cognitive and emotional skills. This investment in long run is envisaged to contribute in developing youth (30% of total population of Malakand Division) to be responsible citizen of Pakistan.